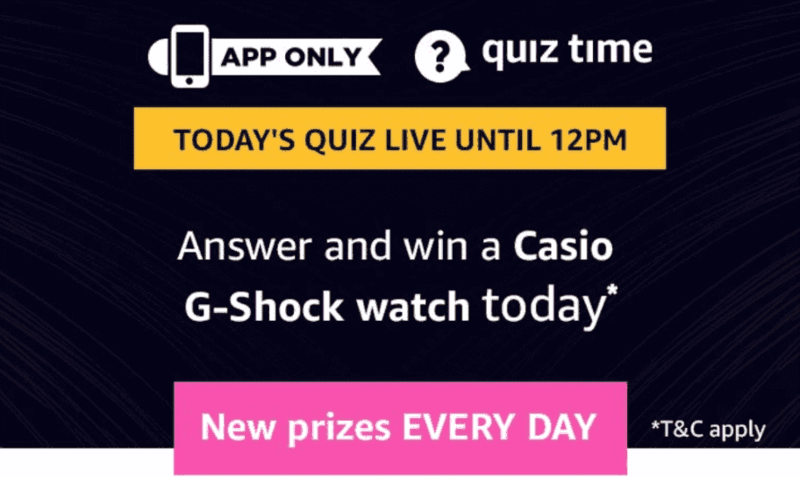 Amazon Casio G-Shock Watch Quiz Answers: 28th March 2019, Amazon has again come up with a new offer. Now Amazon is offering Casio G-Shock Watch Quiztime. This quiz is valid only for today. So hurry up and play this quiz. Offer is applicable from 28th March 2019 8:00 Am to 28th March 2019 11:59 Pm. Q1. What does AR in AR Rahman’s name stand for? Q2. The East India Company came to India in 1600s, but established control only in _____ after the Battle of Plassey when it took over the province of Bengal. Q3. Shanghai is currently the most populated city in the world. But which was the first city to reach a population of 1 million? Q4. A litre of hot water weighs more than a litre of cold water. Q5. A regular email has the recipients section, as well as CC and BCC. What does BCC stand for?